The credits are based on the AFI Catalog. Matti Salo: Waldo Salt wrote most of the screenplay but in the shadow of the black list had to fight to get even a modest credit. Also Horace McCoy participated in the screenplay as Joseph Losey's partner. (Matti Salo: Joseph Losey - vainottu muukalainen [Joseph Losey - A Stranger on the Prowl]. Helsinki: Like, 1989). Matti Salo's book, with a lot of original research, belongs to the best written on Joseph Losey. Filming locations according to the IMDb: Los Angeles, California: - Alta Vista Apartments, 255 S. Bunker Hill Avenue, Bunker Hill, Downtown - Bradbury Building, 304 S. Broadway, Downtown - Bunker Hill, Downtown. The uniqueness of Fritz Lang's M has perhaps been grasped with the most profound insight by Noël Burch. Fritz Lang's M is a thriller without an identification structure or even a central character. It is on a different level of existence than Lang's other films, and it is based on a unique mode of narration without a predecessor. It was a challenge for Joseph Losey to remake the film he greatly admired and whose Brechtian affinities he was privileged to recognize. 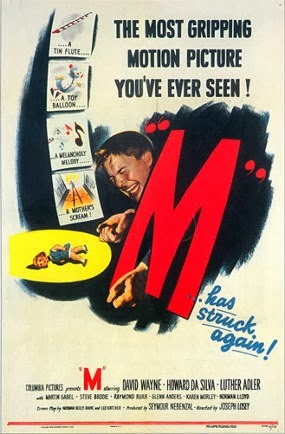 Joseph Losey's M is also a unique and distinguished film but traditional in its approach. The most important difference: there is a central figure in Losey's version, although he is no identification figure. In Lang's film the killer is mostly invisible and unknown until towards the end. In Losey's film the murderer is the main character from the beginning to the end, and from the very start we realize that he is both a criminal and a victim of destructive urges of his mind. Fritz Lang's M is a visually unforgettable and striking film, but so is Joseph Losey's, although his interpretation is completely different. Losey makes as good a use of Downtown L.A. as Lang did of Berlin. Losey's talent in creating a dynamic space is on display both in exteriors and interiors. The Bradbury Building sequence is a showcase of his mastery, again quite different from Lang's corresponding sequence. The "Elsie" sequence in Losey's adaptation is a letdown. Shot by shot I was comparing it with Lang, recognizing Lang's superiority. The mother's agony. The empty dinner table. The staircase. The ball. The balloon. It must have been frustrating for Losey. Yet there are but a few other scenes where Losey duplicates Lang's visual concepts. The cheap café where we see the killer through the grating. The scene where the "M" chalk figure is branded on the killer's shoulder. The montage of close-ups in the kangaroo court sequence is impressive both in Lang's and Losey's films. Losey's M has a music score; Lang's M had none: only the whistling of "In the Hall of the Mountain King". In Losey's film the killer is a Pied Piper with a little tune which he whistles and plays on his little flute. There is a topical charge in the mass hysteria moments when innocent friendly people are harassed, suspected of being the child killer. Berlin before Hitler. Los Angeles during the witch hunts. David Wayne's performance as the killer is superb and original, with no connection with the legendary Peter Lorre performance. Although there are good and well-known actors in the cast, the actors both in the police corps and in the crime organization remain less distinctive than in Lang's film. Lang's parallel montages of the police detection work and the criminals' methods of investigation are humoristic and electrifying; Losey's less so. Besides such a distinguished film as Losey's M the superiority of Lang's M is evident. The miracle of Lang's M is based on a combination of Verfremdung and pathos. The story is about criminal pathology, and yet it is above all a portrait of a society: how one sick criminal shatters everybody's lives. This epic width and fullness is not as well accomplished in Losey's version as in Lang's. The print was good and complete.